If you are in the market for a case which adds a second E-ink screen to your smartphone then you might want to head over to Kickstarter tout suite. There's a funding campaign going on right now which is already oversubscribed and is about to run out of prizes. A certain quietly reputable ereader design firm launched a Kickstarter project this morning to fund their next product. Oaxis is taking their expertise in devloping gadgets with E-ink screens and turning it towards a new product category: smartphone cases. A number of smartphone cases with E-ink screens have been announced over the past few years, but they all shared one flaw: each case was designed to fit a certain model smartphone. Given that there are hundreds of models on the market, this is something of a troubling problem - one which Oaxis has solved. The ereader unit is reversible, and can be mounted facing in either direction. As I told you back in February, the ereader component sports a 3.5" Mobius E-ink screen with a screen resolution of 360 x 600, or around 200 ppi. (Or at least that is what the spec sheet said when I put my hands on the device at CES 2014.) The screen, battery, and circuit board are the most expensive parts of the Inkcase Plus, and by separating them into a modular component Oaxis has both reduced the manufacturing complexity and multiplied the number of smartphones they can support. This is a far better design than the first-gen Inkcase, which was launched last year for the iPhone 5 and Samsung Galaxy Note 2. I reviewed one last fall, and found it to be disappointing, especially in the software department. If you want to add an E-ink screen to your smartphone then this is the project to get behind. Unlike PopSlate, which has been around for a couple years without shipping a damned thing, Oaxis has a history of producing and licensing their hardware designs. its partners include many different companies in the US, Europe, and around the world. But Oaxis doesn't have such a good record when it comes to software, and that could be the one area where the Inkcase Plus falls down. 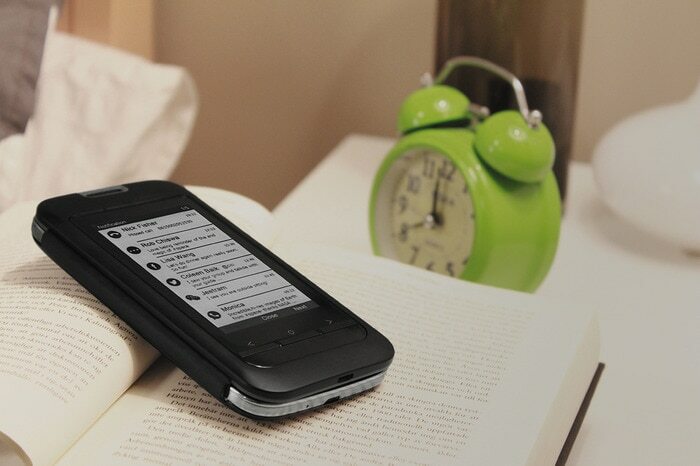 According to the Kickstarter page, the Inkcase Plus can act as an ebook reader, display notifications and photos, and interface with sports/fitness apps (the data is sent over Bluetooth). The model I reviewed last fall didn't work nearly well enough to justify its $99 price tag, but almost a year has passed so there's a good chance that the software has been expanded and improved. But we'll have to wait for hands-on reports to be sure. The Inkcase Plus is scheduled to ship in October 2014. Looks like this is the device I will get for Christmas instead of the inkphone. Is the screen front-lit like on the InkPhone? I don’t think so. That would be a good addition, but it will have to wait for the next model. The big problem with all these e-ink “second screens” is the limited capabilities. My main usage for such a screen would be to use it as the display for the e-book reader software that I use. Until any of these will be able display whatever us being sent to the primary screen (while keeping the primary turned off to conserve power), I consider these to be cute gadgets but not really useful as portable readers. I’d never believe that the e-reader software that they develop will be even close to the leading reading application on the market. Also – I liked much more the solution by Pocketbook – powering the second screen via the phone itself. If I wanted another device that I’d need to charge every several days, I’d have bought the Onyx Phone or even one of the more compact 6′ android readers. Nate, did you see their 8″ reader. It looks tempting but I can’t find any specs on it. I think that is the same device which Trekstor and other companies (Icarus?) released in 2013. I would not buy it, not at that price. Thanks. I did find specs on it later and it has a sigle processor and 256 mb of ram. Outdated specs. That’s a shame. I was hoping it would turn out to be an updated model.